Amongst the most eminent Norman families in the train of WILLIAM THE CONQUEROR was that of BEAUCHAMP, and amongst those that shared most liberally in the spoils of the Conquest. HUGH DE BEAUCHAMP, the companion in arms of the victorious Norman, who obtained grants to a very great extent from his triumphant chief, as he appears, at the general survey, to be possessed of large estates in Hertfordshire, Buckinghamshire and Bedfordshire, was the founder of this illustrious house in England. WALTER DE BEAUCHAMP, of Elmley Castle, Gloucestershire, having married Emeline, daughter and heiress of Urse d'Abetot, Constable of the castle of Worcester and Hereditary Sheriff of Worcestershire, was invested with that office by HENRY I, and obtained a grant from the same monarch of all the lands belonging to Roger of Worcester, with a confirmation of certain lands given to him by Alice, widow of his father-in-law, the said Urse. WILLIAM DE BEAUCHAMP (c1105-70), who, for his zeal in the cause of the Empress Matilda, was dispossessed of Worcester Castle by KING STEPHEN, to which, and all his other honours and estates, however, he was restored by HENRY II; and in that monarch's reign, besides the sheriffdom of Worcestershire, which he enjoyed by inheritance, he was Sheriff of Warwickshire, Sheriff of Gloucestershire, and Sheriff of Herefordshire. WALTER DE BEAUCHAMP, Governor of Hanley Castle, Worcestershire. WILLIAM DE BEAUCHAMP (1237-98), who inherited not only the feudal Elmley from his father, but had previously derived from his mother the Earldom of Warwick (originally possessed by the Newburghs) and the Barony of Hanslape. Isabella; Maud; Margaret; Anne; Amy. GUY, 10th Earl (c1272-1315), so called in memory of his celebrated predecessor, the Saxon, Guy, Earl of Warwick. This nobleman acquired high military renown in the martial reign of EDWARD I, distinguishing himself at the battle of Falkirk, for which he was rewarded with extensive grants of lands in Scotland. Maud; Emma; Isabella; Elizabeth; Lucia. THOMAS, 11th Earl (c1313-69), KG, who sustained, in the brilliant reign of EDWARD III, the high military renown of his illustrious progenitor, and became distinguished in arms almost from his boyhood. Maud; Philippa; Alice; Joan; Isabel; Margaret; Agnes; Juliana; Katherine. 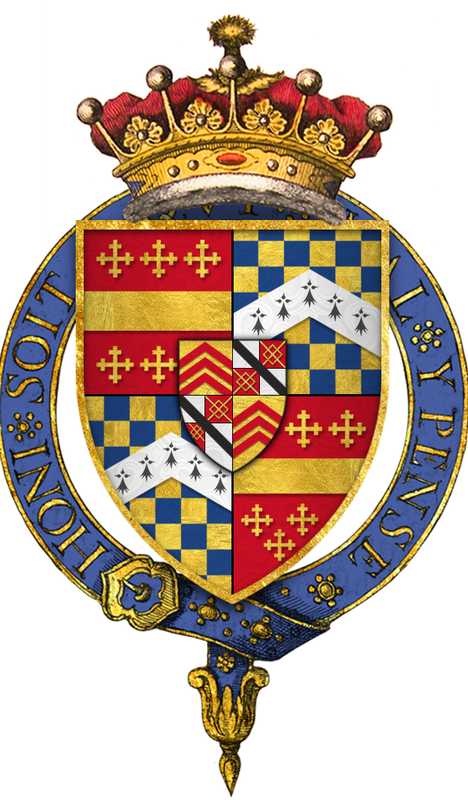 HENRY, 14th Earl (1425-46), KG, who, before he had completed his nineteenth year, tendered his services for the defence of the Duchy of Aquitaine, was created, in 1444, PREMIER EARL OF ENGLAND; and his lordship obtained, at the same time, permission for himself and his heirs to wear a golden coronet in the presence of the King and elsewhere. Soon afterwards, in 1445, he was advanced to the dignity of a dukedom, as DUKE OF WARWICK, with precedence immediately after the Duke of Norfolk, and before the Duke of Buckingham; which extraordinary mark of royal favour so displeased the latter nobleman that an Act of Parliament was subsequently passed to appease his jealousy, declaring that the two dukes should take place of each other alternately year about, but with precedency of the first year to the Duke of Warwick. After which His Grace had a grant in reversion of the death of the Duke of Gloucester, of the Channel Islands for the annual rent of a rose; also the Hundred and Manor of Bristol, and all the royal castles and manors in the Forest of Dean. His Grace was crowned, by the King himself, KING OF THE ISLE OF WIGHT. The 1st Duke married, in the lifetime of his father, but when ten years old and then styled Lord Despencer, Cecily, daughter of Richard Richard Nevill, jure uxoris 5th Earl of Salisbury, by whom he had an only daughter, ANNE. ANNE, 15th Countess of Warwick (1443-48), then but two years old, who was committed to the guardianship first of Queen Margaret, and afterwards of William de la Pole, Duke of Suffolk. ANNE, 16th Countess of Warwick (1426-92), wife of Richard Neville, Earl of Salisbury; and her husband was subsequently created EARL OF WARWICK, the celebrated Kingmaker. Ancestral seat ~ Warwick Castle, Warwickshire. Town House ~ 32 St James's Square.